Hi-back toilet support featuring a contoured padded back and belts to aid and support individuals with disabilities when positioned over a toilet. 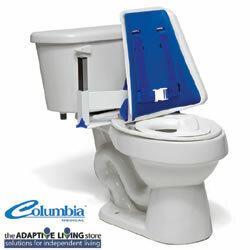 Inspired By Drive, formally Columbia Medical, Hi-back Toilet Support featuring an orthopedic-contoured back and belts to aid and support individuals with disabilities when positioned over a toilet. Inside Back Width at Bottom 12"
Inside Back Width at Top 8"
Inside Back Width at Bottom 14"